(photo): Reps Dauphinais and Hayes talk with Fire Marshall Randy Burchard regarding the recent fire that occurred at the Acme Cotton Mill. 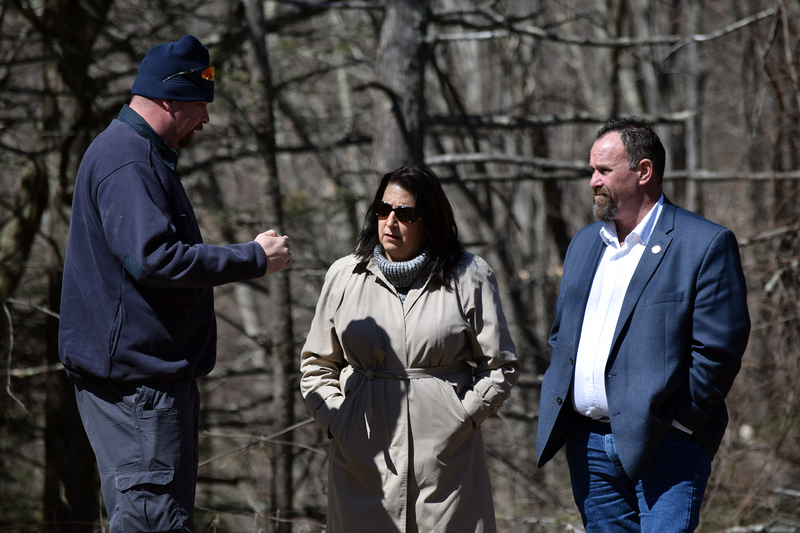 KILLINGLY – State Representatives Anne Dauphinais (R-44) and Rick Hayes (R-51) spent Monday afternoon speaking with Killingly’s Fire Marshall and Town Manager about the recent fire that destroyed a local mill and to offer their support moving forward. Both Dauphinais and Hayes joined Randy Burchard Town Fire Marshall and Mary Carlio Killingly Town Manager at the site to the former Acme Cotton Mill for an onsite evaluation and see the extent of the damage caused by the fire. The mill had recently been purchased and the development of this property was part of a larger economic project for the town of Killingly. Clean up of the property had been underway and plans for the mill included building several apartment type units. Additionally, there were hopes to retain the building over the water for restaurant or commercial possibilities. Rep. Dauphinais said they have already reached out to DEEP regarding the cleanup. Should Vaccines Be Mandated Presentation by Robert F. Kennedy Jr.